Who is covered by the Longshore and Harbor Workers' Compensation Act? The LHWCA is a part of a set of federal workers’ compensation laws that are meant to provide coverage to employees that are not traditionally covered by state workers’ compensation statutes. In general it covers “maritime workers” which it divides into two camps – longshoremen and harbor-workers. In general, the term “longshoring operations” refers to the loading and unloading of cargo from a vessel and the term “harbor-workers” is defined to include those that build, repair and deconstruct ships. There are a number of people that are specifically excluded from coverage under the LHWCA, but if and only if they are covered by state workers’ compensation laws. First, people employed to perform office work or secretarial work, data processing or to provide security, are not included under the act. Maritime work oftentimes involves some work that is arguable clerical in nature, especially in the loading and unloading of ships, but this exception only applies if the employee is exclusively employed to perform these tasks, i.e. performing a little bit of clerical work as part of another job will not in and of itself prevent an injured worker from claiming benefits under the Act. The Act also excludes people that are employed by a club, camp, recreational operation, museum, restaurant or retail outlet. In addition, people that work for vendors, transporters and suppliers are not covered if they are injured when visiting the premises of a business engaged in maritime work as long as they are not performing the same kind of work performed by that business. In other words, the Act excludes people that are not involved in traditional maritime work even if their duties bring them into contact with true maritime employees. Employees of a marina are not covered unless they are involved in the construction, expansion or replacement of the marina. Individuals building recreational vessels that are 65 feet in length or shorter are not covered. Nor are people employed to repair any recreational vessel or to dismantle any part of such a vessel in connection with its repair. 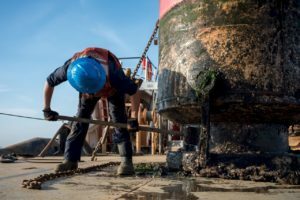 The statute used to state that employees repairing vessels under 65 feet in length were excluded from coverage, but the current version of the act expands these exclusions to apply to “any recreational vessel” 33 U.S.C. 902(3)(f). Acquaculture workers (people who raise and breed fish) are also excluded from coverage under the Act. In addition there are exclusions for people that are covered by the Jones Act, namely members of a crew or ship masters as well as people employed by masters to load, unload or repair a vessel that is less than 18 tons net. The LHWCA is a good way for Maritime workers to receive medical and wage loss benefits following an injury on the job, but getting coverage under the Act can be tricky. Frequently, the employee gets told both by the state workers compensation carrier and the longshoreman that neither is providing coverage for their injury. In those cases it makes sense to file both types of claims at the same time and then choose the one that looks to be more successful. The Humphries Law Firm, P.C. represents injured maritime and land-based workers against insurance companies and employers to obtain the compensation due an injured employee under state and federal laws.